What do you first think when coming across a new song by Big Jim Wynn, a tenor saxophonist who pre-dated rock – and many might say predicted many of rock’s excesses on the instrument during that time – but whose work since rock ‘n’ roll elbowed its way into the mainstream black music market over the past year has been decidedly lackluster? What do you think when that song uses the word “Bop” in its title, a decidedly jazz oriented term which hints that maybe Big Jim is ready to pack it in and head back to that realm and leave this noisy rock ‘n’ roll to the younger generation? Could it be that Wynn has already given up on conquering the music he seemed somehow pre-destined to lead? What do you think of an artist – any artist – who finds themselves creatively adrift, floundering in a stretch of uncertainty and increasing self-doubt as to their place in the music world? Do you have sympathy for their plight? Do you pity them for their bad timing? Or do you not care much at all for the fate of someone who might have been among the trend setters in this field had he had better instincts, but who blew each and every chance he got to definitively stake his claim as rock music developed at a rapid pace this past year? What do you think of those whose entire life was devoted to one thing… one thing he did exceedingly well… yet because of the quirks of fate he was now shaping up to be forgotten as time marched on without him? What do you think you keep reading and find out how someone like this could never seem to break through despite possessing all of the tools to excel in an era that was custom made for him in almost every conceivable way. Every way but one, that is. Jim Wynn, as we’ve said before, came along a decade too early for rock stardom. It’s not just he wasted a good many years playing in an era that wasn’t as suitable for his flashier approach, but it’s more that when the right type of music did come along he was already a victim of conformity. While he was more than happy to act up on stage to get a rise out of audiences he treated recording sessions with the proper decorum that the earlier bands demanded. He was never fully able to break free of that outdated mindset… try as he might he never quite understood what kind of wild displays on record were needed to take full advantage of the opportunities rock ‘n’ roll presented. He had everything else going for him. He played the right instrument, he had all but invented the showmanship aspect that others would soon take over and claim for themselves, and he even seemingly had the one thing that many of his contemporaries were lacking as they tentatively cast an eye towards rock as a way to salvage a career in a period of radical stylistic changes… he had an open mind musically. 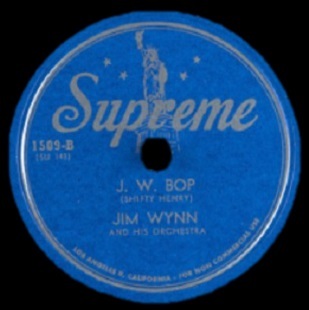 It’s not just that Wynn had pioneered many of the more flamboyant aspects of playing tenor sax, which had taken that instrument from the back row of the brass section in big bands to the front of the stage bathed in a white hot spotlight as time went on which rock then took to the extreme, but rather he seemed comfortable playing in all types of styles. The jazz background he came from placed his strongest allegiances there but he wasn’t beholden to it by any means as he’d already shown by his bar-walking, dropping to his knees antics on stage. He would later go on to a long association with bluesman T-Bone Walker, a style that rarely utilized horns to the extent that Wynn incorporated showing he was perfectly capable of adapting to an entirely different form of music. He could play fast, he could play slow. He could alternately raise the roof or lower your eyelids and your heart rate as he blew a seductive line. He even came up with song titles that drew your curiosity, something which was vital for instrumentals to first get noticed. Yet time and time again when presented with a chance to deliver a definitive performance that would establish himself as the top dog on the block in rock ‘n’ roll, a snarling, growling, vicious horndog of the highest order, Jim Wynn instead found a shady spot in which to lay and lazily chew on a bone. Nothing about J.W. Bop is going to change your opinion of Wynn as rock’s ultimate underachiever, but the real question isn’t why he failed to meet his potential with these songs, but rather why he ever felt these songs were the way in which to further his career in any field. That underwhelming statement as to the results of his work probably has you ready to just skim the rest of this review, assuming that this record is – to keep the canine association of the last section going a little more – absolute “dogshit” hardly worth hearing. But that’s not the case. For while J.W. Bop isn’t a great record by any means, it’s also not an awful one. It is however a confusing one if you’re trying to make sense of where Jim Wynn’s head was at in 1948. I know we’ve covered this ground extensively so far in rock’s journey but it never hurts to review the context of things, especially when we’re seven decades removed from these records being released. Without context we look back now and hear songs that don’t fit into what followed and thereby defined rock ‘n’ roll going forward, but we don’t always take into account what preceded it and what the musicians thereby were basing their decisions on when recording these things, thinking that it might be a better fit with what was already established. In that regard J.W.Bop makes a little more sense. But only a little. Despite the title this is not a song that has much to do with bebop other than employing multiple instruments playing disparate solos. The jazz subgenre that was busy reshaping concepts of music with their dexterity and non-linear chord and melodic concepts was far more of an observational style of music for listeners than this could ever claim to be. Bop wasn’t for dancing or grooving along to an easy to follow tune, it was a work of impressionistic art meant to impress the musically astute. By contrast this song has a very definite groove to the underlying rhythm and can be easily danced to when concentrating on that aspect of it as played by the horn ensemble. The solos however take it away from that, each one going off on their own, trumpet, alto, clarinet, piano and tenor sax, even the stand-up bass gets a moment of its own. They’re all well played, certainly harmonically interesting and in spite of the differences inherent in each offering they aren’t indulgent, nor do they conflict with one another or the ever-present backing. But what they DON’T do is present any case for Jim Wynn himself to be a headliner. The reason is, quite frankly, he’s only one small part of the entire arrangement (or two, as he played both sax and clarinet here), but he was no more or less significant than any other in the group, from the bassist and drummer who hold down the bottom to the other horns or the keyboards. In fact, because no aspect of this jumps out at you it’s a decent probability that should your mind wander for even so much as a second you’ll lose track of who is stepping up to the plate and thus might overlook Wynn’s contributions altogether. That’s hardly the way to make a name for yourself, even if it endears you to your fellow band members. That brings us back to the question of what he was thinking when it came to career advancement. He had to know, veteran musician that he was, that you only have so many records to state your case for stardom. While these types of group efforts that allow each member of the outfit to take a bow on stage might go over well in a club they invariably fail to captivate those listening to them on sterile wax or shellac. This is just the the third session he’s had in the last two years due in part to the recording ban that wiped out most opportunities to record for the bulk of 1948, though Wynn was breaking that union edict in this case all the same. He was at risk for being seen as a musical vagabond as he was already on his fifth record label and the last one before this, Modern, was for a scant two sides comprising a single release. What’s just as troubling when it comes to his career self-management is how he is steadfastly failing to define himself musically by sticking to one stylistic approach, either the one that was most promising commercially or the one which he had the greatest personal affinity for and thus would find the most rewarding to pursue day in and day out. Instead no clear-cut vision is emerging from his material at this time, almost as if he was completely unsure as to what road to follow and so he was heading down each for a quarter mile to see what lay out around the first bend before changing his mind, turning back and going down a different path the next time around. Considering they didn’t have GPS back then that was as sure a way as any to get lost, whether walking, driving or playing music. J.W. Bop has elements borrowed from all sorts of sources, the trading off of solos that was prevalent in bop, the churning rhythm of rock to hold it down, the instrumentation of more mainstream jazz, without settling on any of them. But maybe the most damning criticism of him you can make is how he seems to be treating music as little more than a hobby, not that of a serious professional who is looking to earn a living and a reputation on what they play. What makes Wynn so endlessly frustrating is his ability never seems to match his output, though honestly WHAT he plays here is fairly good. His tenor sax part, which is where he needs to impress if he wants to make hay in rock ‘n’ roll, may be under-powered compared to those carving out the biggest share of the pie in this field, but it’s hardly weak or uninspired. He just doesn’t seem to care about drawing any added attention with his solo and so it merely fills space without looking to transform that space by virtue of his passion or commitment to the role. But pleasant records filled with serviceable playing and decent arrangements only make sense in a different context than the one he finds himself in during the latter stretches of the Nineteen-Forties. Had he already become a star then a song like this, meant to showcase his skilled band, is something generous and even honorable. As a song on the bandstand to play before introducing each member to the enraptured audience J.W. Bop might even be very effective. Yet as a declarative statement as to his career direction this does nothing other than add to the confusion. Though he probably didn’t fully grasp this at the time, although maybe looking at the emerging musical landscape and his diminishing opportunities as of late he should’ve, Wynn was running out of chances to carve out a defining niche in the industry. Though with his versatility and skill he’d always be able to find a job, that was a far cry from being a headliner who commanded attention no matter what records he released. So with all that said what ARE your feelings on someone like Big Jim Wynn? Compassion or contempt? Interest in what he’d do next, or indifference for whatever path he chose? More and more I think the answer is probably resignation. Whatever the reason Jim Wynn seemed content to merely exist in music and leave it others try and bend it to their will. But while that genial apathy might make for a less stressful life, in the end it also made for a far less notable career. Leave a reply on "Big Jim Wynn: “J.W. Bop”"